This is OUR Summer Challenge. Please send in a small blurb (paragraph and pic), geared toward one or more of the Critical Steps above. I hope you accept this challenge and look forward to some great posts this summer. 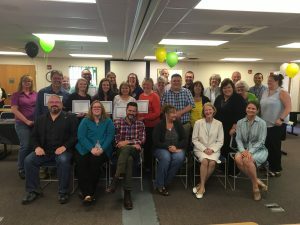 Kudos to the recent NH Department of Environmental Services Lean Yellow Belt graduates. Yellow Belt is a hands-on introduction to the philosophy and methodology of Lean process improvement. PS special thanks to Kate McGovern for making a special trip to 29 Hazen Drive to teach everyone these new skills. Also, thanks to Felice Janelle, Alan Moulton and Vince Perelli to facilitate the hands-on Lean events, during this training. 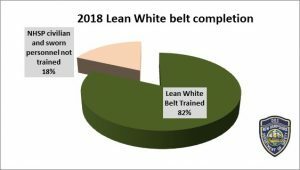 The State of New Hampshire Lean community would like to congratulate the June 2018 Green Belt Class. The new members received their certificates and were joined by the Black Belt Class of 2015. On Thursday June 7, 2018 Colonel Christopher Wagner, Lt. Jeff Ladieu and Sgt. 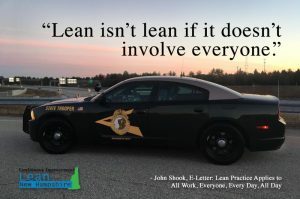 Thomas Lencki spoke about Lean and the State Police on the NH Today with Jack Heath Radio Show. Every Thursday the State Police conducts a segment on the NH Today with Jack Heath, that highlights the men and women of the State Police. Jack Heath had never heard about Lean and how successful it has been for the State Police and Department of Safety. The segment was very informative and as the group was leaving the studio, a listener commented that she had adopted a Lean way of thinking many years ago and she was excited that the State Police had also adopted a Lean way of thinking. Sgt. 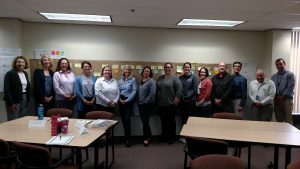 Thomas Lencki has been working on creating a positive Lean Culture in the NH State Police, for his Lean Black Belt Project. One goal was to offer basic training to all State Police employees. The NH State Police has 566 employees (Civilian and Troopers) and 463 of them have received training and their certificate in Lean White Belt in 2018. Process improvement is used every day at the NH State Police in many different areas. Lean is not something you do once and forget about it. Lean is a way of life, a way of thinking. We hope you join the NH State Police in becoming a change agent as progression starts now!